A short cut and cover tunnel is located on southbound Interstate 405 just prior to the interchange with Interstate 90. Photo taken 08/31/06. Interstate 405 provides a bypass to the east of Seattle, connecting with several major suburbs on the east shore of Lake Washington. The freeway is the most direct route to Redmond, home of Microsoft, via the Washington 520 freeway. As a result of growth in the greater Seattle area, Interstate 405 carries significant traffic volume, almost on a level like its sibling in California, albeit with fewer lanes. To alleviate some of this congestion, a second north-south freeway is being considered for the eastern suburbs of Seattle, dubbed as Interstate 605 by some. It remains unclear if this new highway will be constructed. Interstate 405 is part of High Priority Corridor 35: FAST Corridor. State named trailblazers for Interstates 5 and 405 precede the eastbound on-ramp from Seattle-Tacoma International Airport to Washington 518. Photo taken by Jeff Royston (02/24/06). SR 509 south at the eastbound on-ramp for SR 518 to Seattle-Tacoma International Airport (SEA) and Interstates 5 and 405. Photo taken by Chris Elbert (03/03/06). Interstate 405 weaves northward between the Alderwood Manor and Martha Lake communities 2.9 miles from SR 527 to SR 525 and I-5. Photo taken 08/29/06. The unnumbered ramp for I-5 north departs next for Vancouver, British Columbia. Photo taken 08/29/06. Interstate 5 heads north from I-405 at Martha Lake to Everett, Marysville and Bellingham. SR 525 extends the freeway northwest to SR 99 en route to Mukilteo. Photo taken 08/29/06. The right lane drops at the loop ramp for southbound Interstate 5 to Lynwood and Seattle. Two lanes transitions onto northbound Washington 525. Photo taken 08/29/06. An end shield is posted for Interstate 405 along with a begin Washington 525 shield. Photo taken 08/29/06. Interstate 5 angles southwest through Lynwood to Mountlake Terrace and Shoreline before reaching the Seattle city limits. Photo taken 08/29/06. 1.5 miles north of I-5 south and I-405 south on Washington 525 at North Lynnwood. Photo taken 08/29/06. The next exit along Washington 525 south is the connection to Interstate 5 southbound to Seattle. Photo taken 08/29/06. The entrance ramp from Alderwood Mall Parkway forms an auxiliary lane along SR 525 south to I-5 south. Photo taken 08/29/06. Beyond the off-ramp to Interstate 5 south, SR 525 transitions into Interstate 405 southbound. There is no access to I-5 north in this direction. Photo taken 08/29/06. Interstate 405 begins at the south end of Washington State Route 525 above I-5. Photo taken 08/29/06. Interstate 5 advances south through a six-ramp parclo interchange (Exit 183) with 164th Street SW at Martha Lake to meet the north end of I-405. Photo taken 08/30/06. An HOV ramp passes overhead from the Ash Way Park and Ride Lot one mile north of Interstate 405. Photo taken 08/30/06. Two lanes link I-5 south with Interstate 405 at Exit 182. Interstate 405 ostensibly provides a bypass of Seattle but instead comprises a crowded commuter route through Seattle’s eastern suburbs. Photo taken 08/30/06. Interstate 405 runs along the east side of Lake Washington from Bothel south to Renton. There is no access to Washington 525 north from I-5 at Exit 182. Photo taken 08/30/06. Exit 181A connects I-5 with 44th Avenue West to SR 524 in Lynwood just ahead of Alderwood Mall and the systems interchange with SR 525 north and Interstate 405 south. Photo taken 08/30/06. 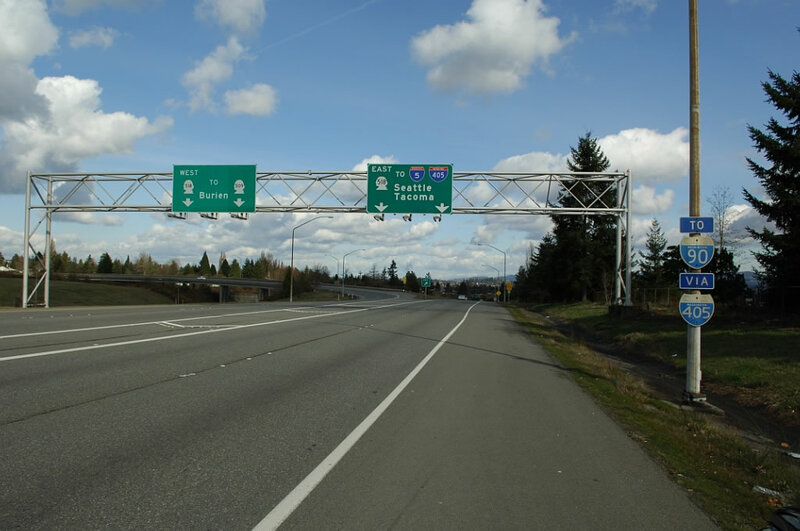 Exit 182 separates from Interstate 5 north in a half mile for SR 525 north to Mukilteo and I-405 south to Bothell and Kirkland. Photo taken 08/30/06. Interstate 5 north reaches the off-ramp (Exit 182) for I-405 and SR 525. Photo taken 08/30/06. Interstate 405 south concludes at a directional cloverleaf interchange with I-5 and Washington 518. The ramp for I-5 north to Downtown Seattle includes access to adjacent Southcenter Boulevard and Westfield Southcenter mall. Photo taken by Chris Elbert (03/03/06). A loop ramp connects I-405 south with Interstate 5 south to Federal Way and Tacoma. The I-405 freeway extends west as Washington 518 to SeaTac and Burien. Photo taken 08/30/06. Leading east from Seattle-Tacoma International Airport (SEA) toward I-405, traffic on Washington 518 increases to succeeding ramps for Southcenter Mall and Interstate 5. Photo taken 08/29/06. Construction in 2008 added a third eastbound lane along SR 518 ahead of the ramps for Interstate 5. This sign bridge and butty copy overhead for 51st Avenue South was removed during the expansion project. Photo taken 08/29/06. A left exit connects SR 518 east with I-5 north into Seattle. 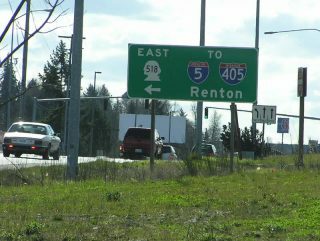 A lane drop occurs at the ramp for I-5 south to Tacoma while a single lane transitions onto Interstate 405 north to Renton. Photo taken 08/29/06. Passing under South 178th Street, Interstate 5 advances one mile north to Exits 154A/B for SR 518 west and I-405 north. Photo taken 08/29/06. The ensuing exit along I-5 northbound links with parallel Southcenter Parkway at Westfield Southcenter mall. 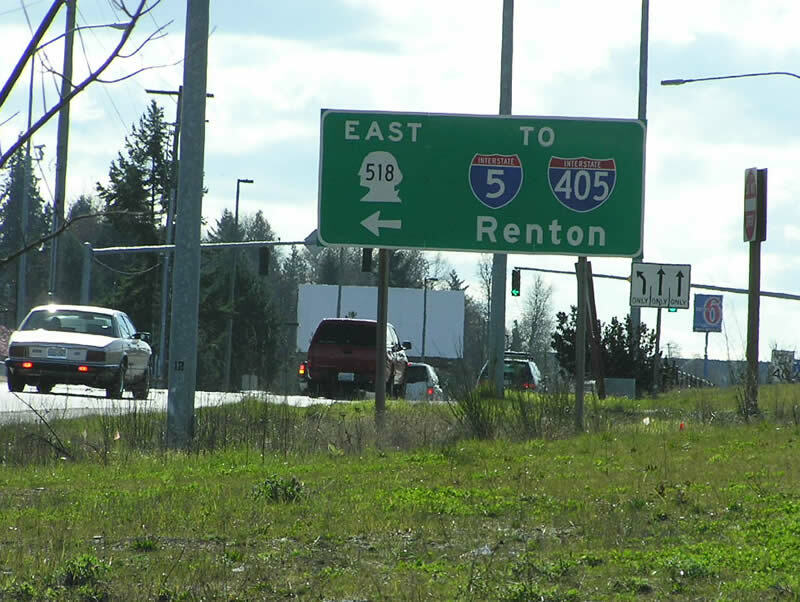 Exit 154 immediately follows for SR 518 and I-405. Photo taken 08/29/06. The directional cloverleaf interchange (Exit 154) with I-405 and SR 518 spreads to the northwest of the Southcenter retail area. Photo taken 08/29/06. Passing under the Southcenter Parkway overpass in Tukwila, a lane drop occurs at the departure of Exit 154B for I-405 north to Renton. A high occupancy vehicle lane separates from the left while the I-5 northbound mainline continues with three lanes through the exchange. Photo taken 08/29/06. Traffic partitions along Exit 154 for I-405 north to Bellevue and SR 518 west to the SR 509 freeway at Burien. Photo taken 08/29/06. The southbound HOV lane along I-5 separates from the freeway mainline just ahead of the wye interchange with SR 599. The exchange (Exit 154A) with Interstate 405 follows. Photo taken 08/30/06. Traffic from SR 599 south combines with Interstate 5 just ahead of succeeding exits for Southcenter Boulevard, SR 518 west and Interstate 405 north. Photo taken 08/30/06. Exit 154B departs for both Southcenter Boulevard and SR 518 west to Sea-Tac International Airport (SEA) and Burien just ahead of the left exits for Interstate 405 north to Renton. Photo taken 08/30/06. Exit 154A leaves I-5 south and merges on the inside lanes of SR 518 east to Intersate 405. Photo taken 08/30/06. Interstate 405 (Washington) @ Wikipedia.org.